College awaits, but the shared dilemma all students face is agonizing. Should you go to college and let loans pick up the tab for the ever-rising cost of tuition? Or, join the workforce directly out of high school and risk earning far less than a college graduate? Decisions, decisions. According to the National Center for Education Statistics (NCES), with a bachelor's degree, you'll make 62% more than you will with a high school diploma. Or, with a bachelor's you'll make $48,500 a year, versus $30,000 a year with a high school diploma. The high school grad who doesn't have a big chunk of change must weigh the cost of incurring debt against their projected earnings, and many have opted to risk the debt. Nationwide, student loan debt is rising at the rate of $2,726 per second, with a cumulative tab at about $1.3 trillion. But why does debt have to be the theme of a post-graduate life? You can go to college and avoid debt. Here's how. Unlike scholarships, grants are based on your Expected Family Contribution (EFC) and financial need. Fill out your free application for Federal Student Aid (FAFSA) as early as you can. Grants from schools go to those who need them the most and those who apply for aid the earliest. You may be eligible for the Pell Grant, which the federal government awards to 10 million students a year. You may also be eligible for state grants: the Federal Supplemental Educational Opportunity Grant (FSEOG), the Teacher Education Assistance for College and Higher Education (TEACH) grant, as well as grants based on your ethnicity. There are now websites specifically set up to facilitate crowd-sourced funding for students to avoid loans, or to pay off loans. You'll do volunteer work in exchange for crowd-sourced funds, for example. Several options here are zerobound and SponsorChange. Have you been a good student? Have you done extracurricular activities, excelled in sports, or are you willing to prove you're worthy of a scholarship? There are so many of these available that you can bet there's something for you — whether it's a $500 accounting scholarship or a $1,000 teaching, art, or entrepreneurial scholarship. Sites such as Fastweb and Scholarships.com offer scholarship databases and information. The key here is to look into as many as you can and work hard at getting them. If you qualify for federal financial aid, you may qualify for the Federal Work-Study Program. Work-study will gain you experience in your field of choice and will pay you to go to school, whether you're a part-time or full-time student. These positions get snatched up quickly, so check with your school's financial aid office as soon as your enrollment application is accepted. You'll be earning experience you can later apply toward your bachelor's at a community college. And on average, tuition and fees for community college are $3,435, while they're $32,405 for university. According to the NCES, an associate's degree only earns you an average of about $11,500 less per year than a bachelor's. If you choose to go for a bachelor's degree, you'll be in school longer, but by the time you're done with community college, you'll be prepared for university. You may also be able to apply some of your community college credits toward earning your bachelor's. You may also have more money saved up for university tuition than you did when you got out of high school. There are also community college scholarships. They can be merit-based, need-based, or entirely unique. Some schools, such as Metropolitan Community College in Kansas City, offer an automatic, merit-based scholarship for the student with a high GPA seeking to transfer to a university. Are you a high school graduate considering a college near your hometown? Most likely, your parents would be happy to let you to live with them if you're paying your way through college. If they are willing to put you up rent-free, you're good to go. You could work a side job at the same time. College isn't about partying and living in a dorm. Sure, it happens, but it's not a requirement. Living at home will help you concentrate on studying and saving money. Be committed for the long-term when it comes to your career, and your life. The staggering facts about student loan debt put it into perspective. If you end up with debt, you could end up living with your parents after graduating, as 27% of graduates do. You could end up falling behind on your loan repayments, as 35% did in 2012. On average, it could end up taking you 20 years to pay off your loan. Commit to going to college after you've saved enough money, and your life will be a lot easier once you graduate — you'll be free to pursue what you want, instead of taking a low-paying job right out of college because you just need the money. Graduate as fast as you can by planning out your degree. This will minimize money you spend. In other words, decide what you want to major in before jumping into general classes, and find the fastest path to graduation. Speak with the financial aid office at the college you want to attend about tuition installment plans. You have to be certain you can pay, but this will make it more like paying rent, which is easier than forking over lump sums. If you're budgeting wisely, living at home, and working part-time, meeting installments shouldn't be a problem. The Federal Direct Loan offers the most options for income-based repayment, including REPAYE, which fixes your payment at 10% of your discretionary income and forgives your debt after 20 years. The Direct Loan also offers debt forgiveness if you're working in a public service field and have made 120 payments without defaulting. Your interest rate will be fixed, unlike a private loan, which sticks you with a variable rate. Pay on the loan as you go through school, and make the biggest payments so you can to avoid paying too much on interest. When doing your taxes, write off interest payments. And be sure to use tax returns and other windfalls to make large payments. 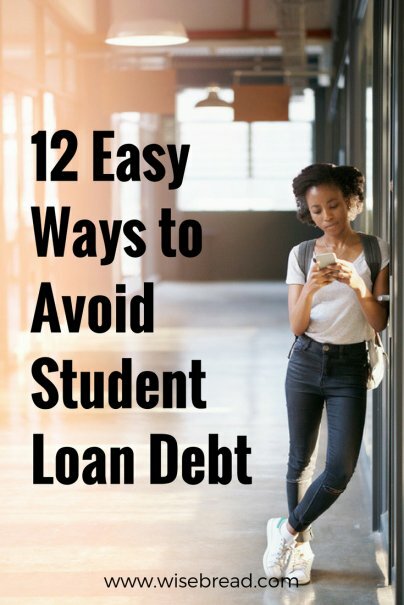 Any other easy ways to avoid student loan debt? Share with us in the comments! Financial writer, financial consultant, and certified social worker.